Cee tagged me this and I so agree, A blogger friend recently discovered that someone copied her post and earned something from it, we felt all bad. I mean? if you want to earn why not try to write your own? so if you're with us in this campaign, please copy and share. 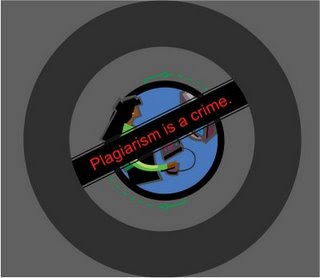 Plagiarism is the unauthorized use or close imitation of the language and thoughts of another author and the representation of them as one's own original work. To all Bloggers who exert effort to create noteworthy entries and who continue to maintain a Blog which is a reflection of who she / he is, " Good job! " To those who have the desire to Blog but are merely scraping contents from other people' s materials, " Whether you are monetizing your site to help you with your basic needs or to satisfy some of your wants, do it the proper way. Stop making money out of someone else's work. Otherwise, you are nothing but a common thief! " Tnx Rocks for helping spread this Tag!